I know I have been absent from the blogosphere for a while, but it is a new year and I am back. 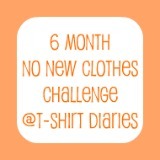 First off is the No New Clothes Challenge! I did it more as a self imposed challenge to stop buying clothes and get back to my sewing basics by making them. I wanted to get rid of all the unnecessary "bargains" I buy in haste. I am the worst kind of shopper, an impulse buyer. I see a shirt at Target on sale for $4.00 and it is in my closet. The problem is cheap clothes are cheaply made and ill fitting. They fall apart and just end up taking valuable space in my home. My "stuff" is beginning to take over my house and I need to do something about it. I am happy to announce that so far their are two other like-minded bloggers who are ready to accept the challenge and several more who will be shopping a little less because although they can not commit they were definitely inspired. Best of luck ladies and I can not wait to see what you do!